Profile: Soaring swiftly through the clouds, Thundercracker gazes with scorn on the creatures below. He is utterly contemptuous of anything that cannot lift itself off the ground and claim the sky. Occasionally, he expresses that contempt by diving and striking, leaving flame and destruction as he again speeds upward. Yet he is not totally convinced of the cause that he serves. Only the words of his Decepticon companions about the rightness of their cause, the destiny of conquest that is their birthright, convince him to go on. He is persuaded because he wants to be persuaded. Without a sense of purpose, Thundercracker would find his life unbearable. 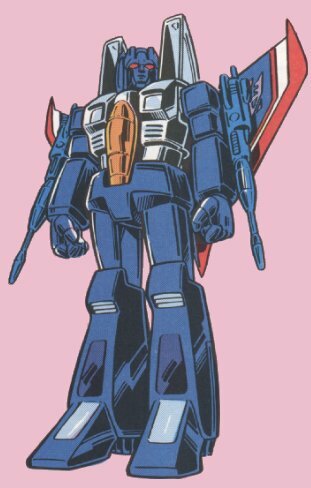 Abilities: Like his fellow Decepticon jet fighters, Thundercracker can attain speeds of up to 1500 mph. He has the additional ability to produce controlled sonic booms of deafening magnitude that can be heard within a 200-mile radius. He can launch a drone rocket with a range of 500 miles that behaves similarly to a cruise missile and has the concussive force of 3000 lbs. of TNT. He has a shoulder-mounted automatic incendiary gun that shoots at 100 rounds per minute heat-resistant ceramic bullets containing a highly explosive flammable material that ignites on impact.